The United States Track and Field and Cross Country Coaches Association (USTFCCCA) have named senior sprinter Shakima Wimbley the NCAA Division I Women’s National Athlete of the Week. She is the first Miami Hurricane to receive the recognition. Wimbley is also the ACC Women’s Indoor Track Performer of the Week for the second consecutive week. She has earned the honor six times in her career. Last Saturday, the sprinter ran the 14th-fastest 400m dash in collegiate history at the McCravy Invitational at the University of Kentucky. The time of 51.28 seconds is the fastest in the NCAA and in the world this year. The women’s track and field team continues to stay in the national rankings. Improving on its No. 14 ranking from last week, Miami is now No. 13 in the country. This is the highest the team has been ranked in an indoor season in eight years – the Canes were No. 12 in the nation during the 2009 National Championship meet. 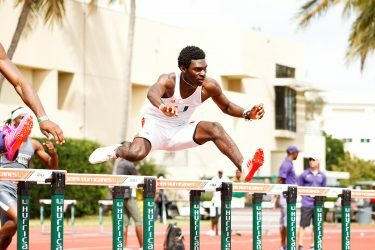 Wimbley and the Hurricanes will continue on their quest to defend their ACC Indoor Championship title. Their next meet is the Meyo Invitational at the University of Notre Dame on Feb. 3-4.